Sea Ice: Physics and Remote Sensing addresses experiences acquired mainly in Canada by researchers in the fields of ice physics and growth history in relation to its polycrystalline structure as well as ice parameters retrieval from remote sensing observations. 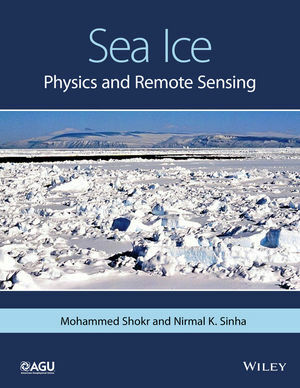 The volume describes processes operating at the macro- and microscale (e.g., brine entrapment in sea ice, crystallographic texture of ice types, brine drainage mechanisms, etc.). The information is supported by high-quality photographs of ice thin-sections prepared from cores of different ice types, all obtained by leading experts during field experiments in the 1970s through the 1990s, using photographic cameras and scanning microscopy. In addition, this volume presents techniques to retrieve a suite of sea ice parameters (e.g. ice type, concentration, extent, thickness, surface temperature, surface deformation, etc.) from space-borne and airborne sensor data. The breadth of the material on this subject is designed to appeal to researchers and users of remote sensing data who want to develop quick familiarity with the capabilities of this technology or detailed knowledge about major techniques for retrieval of key ice parameters. Detailed crystallographic classification of natural sea ice, the key information from which information about ice growth conditions can be inferred. Many examples are presented with material to support qualitative and quantitative interpretation of the data. Methods developed for revealing microstructural characteristics of sea ice and performing forensic investigations. Data sets on radiative properties and satellite observations of sea ice, its snow cover, and surrounding open water. Methods of retrieval of ice surface features and geophysical parameters from remote sensing observations with a focus on critical issues such as the suitability of different sensors for different tasks and data synergism. Sea Ice: Physics and Remote Sensing is intended for a variety of sea ice audiences interested in different aspects of ice related to physics, geophysics, remote sensing, operational monitoring, mechanics, and cryospheric sciences. Mohammed Elsayed Shokr is a research scientist in Science and Technology Branch at Environment Canada. He is also affiliated with IEEE Geoscience and Remote Sensing Society (Institute of Electrical and Electronics Engineers) and the CASI Canadian Remote Sensing Society (Canadian Aeronautics and Space Institute). His research interests include studying sea ice physical and electrical properties which have greater implications in operational monitoring and climate studies. He also uses remote sensing techniques for sea ice modelling. Nirmal Sinha is an Engineer at the NRC Institute for Aerospace Research in Ottawa, Ontario. His research focuses on high temperature materials, like ceramics and advanced alloys that are used inside jet engines or gas turbine engines. This involves applying theories and experimental techniques about how snow and ice behaves around its melting point, to aerospace materials such as titanium-based and nickel-based 'superalloys'.